General Description:Perennial that grows 8 to 31 inches tall from creeping roots, often forming colonies. Plants are light green and have yellow flowers with orange throats and bloom during the summer (June to September). It has a bad smell. Flower Description: Flowers are crowded onto the top 2 to 9 inches of the plant stem. They are yellow with hairy, orange throats. They resemble snapdragons, each having a spur-like appendage at the base. Leaf Description: Leaves are alternately arranged and numerous along the stem. Each leaf is very narrow (linear) and up to 3.9 inches (10 cm) long. They are hairless and have pointed tips. Stem Description: Stems are generally unbranched. Fruit/Seed Description: Flowers form a cylindrical capsule that is about .4 inches long. Seeds are dark in color, brown to black, and are flattened, having a papery wing. 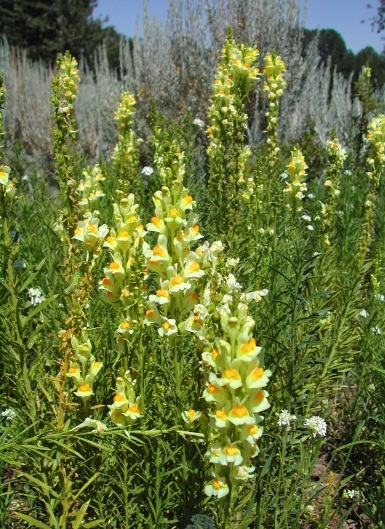 Yellow toadflax can invade rangeland and cultivated fields and compete with desirable plants and reduce their yield. It is seldom eaten by livestock.